Last week, we posted this awesome all-black #OOTD of Liliya’s to show how an outfit of all black can be the answer for a day…and evening…filled with a multitude of tasks. After looking back at some street style I’ve recently shot in New York, Milan, Venice (Italy), and Seattle, I feel that it’s time I share with you the variety of inspiring ways I’ve discovered of dressing monotone. 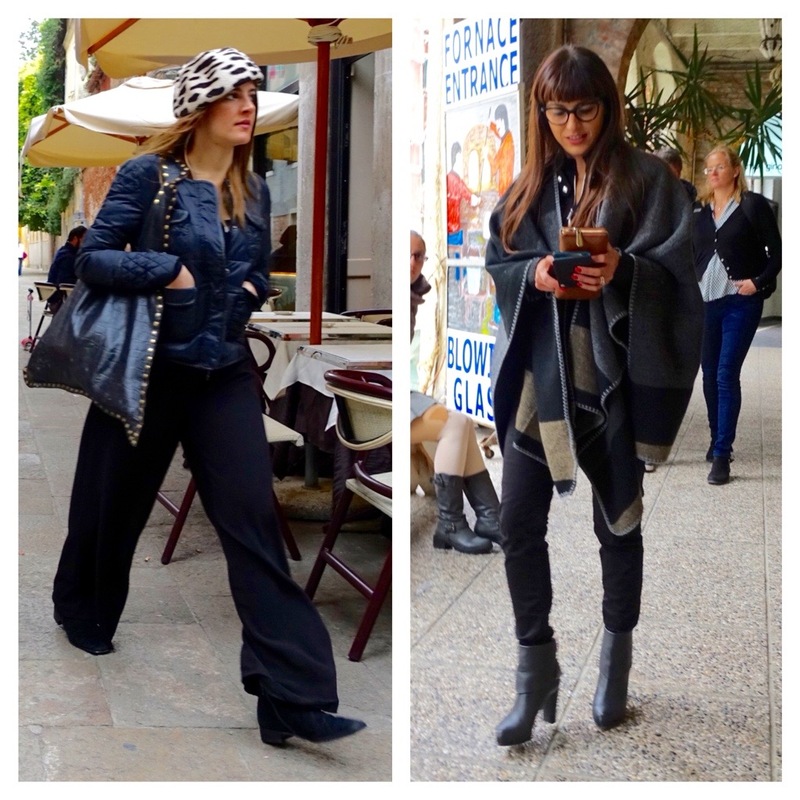 The muse to the left (in Venice) is in a post about style-boosters for a fall trip to Europe. 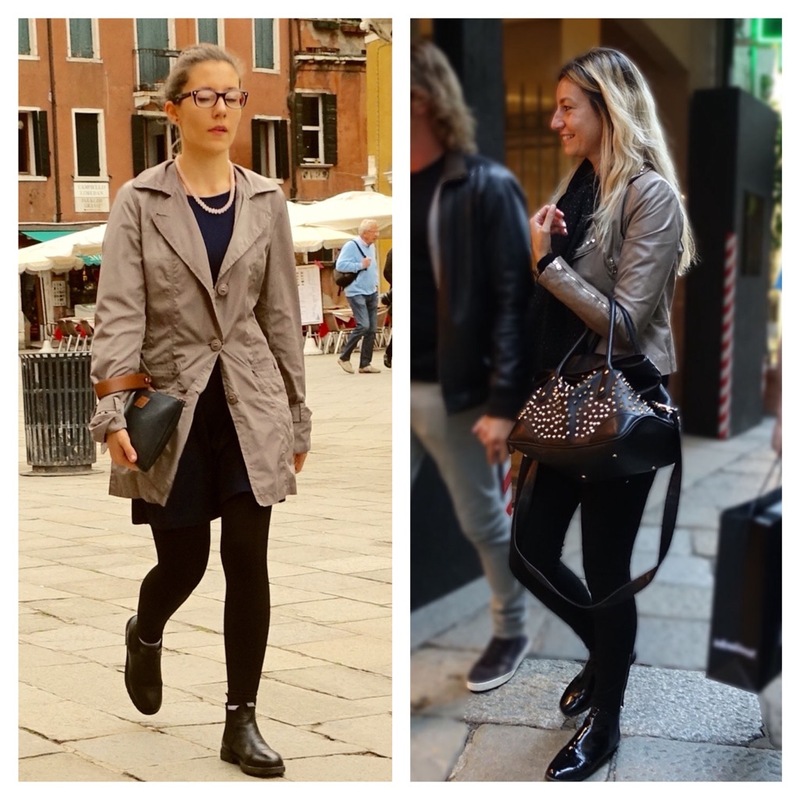 The woman to the right, seen in Murano, Italy. Okay, I know it’s obvious but cannot be overlooked. Since I detest the cold, I am always tempted this time of year to bundle up in a million layers…until I look in the mirror. In this hue, you can get by with an extra layer or two without looking like you’ve packed on major winter weight. 2) When you wear all black, everything matches! There is no need to go out into the sunlight or under bright lighting before stepping out of the house to make sure nothing clashes. I just hope you won’t make the same mistake I recently did; after heading off to work in a black skirt, black tights, black boots, and red sweater, I realized upon arriving that my black skirt was actually blue (dark closet!) ???? You can achieve the same effect even with white or dark grey accents as seen above. 3) Black is simply chic and stylish. Sometimes I bemoan having moved to Seattle, which is Mecca for outdoorsy people (in other words, somewhat sartorially-challenged). 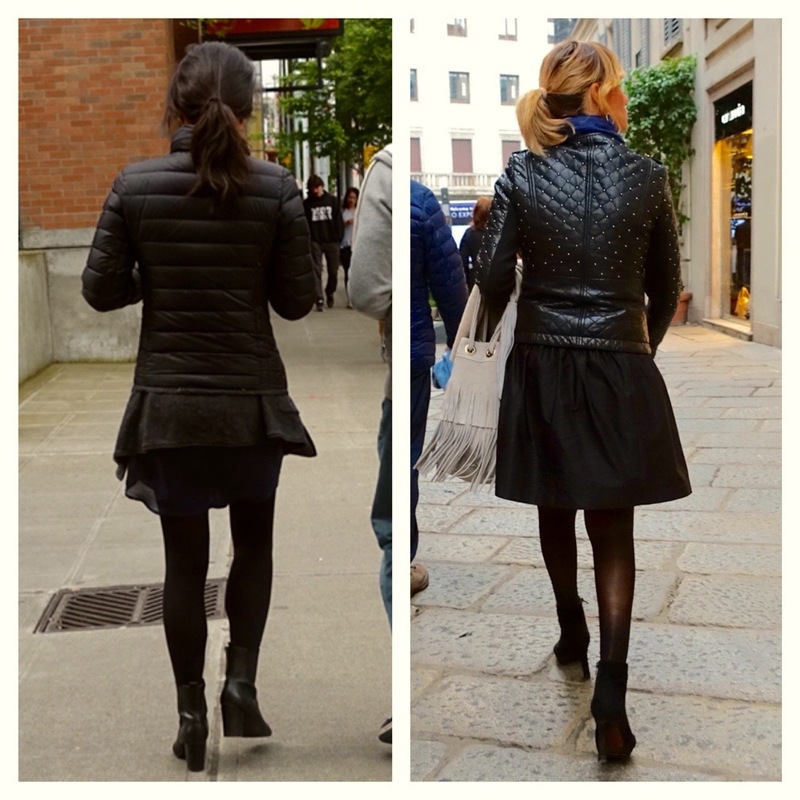 But notice how the Seattleite pictured above and to the left wears a very similar ensemble – just a bit more casual – to the one on the right spotted in Milan (a.k.a. Sartorial Wonderland). Topping an all-black outfit with a neutral or metallic-colored jacket can also look quite sophisticated, don’t you think? 4) Wearing all black allows greater ease in playing with textures, styles, and seasons. Sure, it is fun to mix up different colors with different textures, prints, etc. But when you’re going monochrome, the blending effect makes it practically no-fail and so, we can be more adventurous – in fact, I recommend it! (Otherwise, we venture dangerously close to boring!) 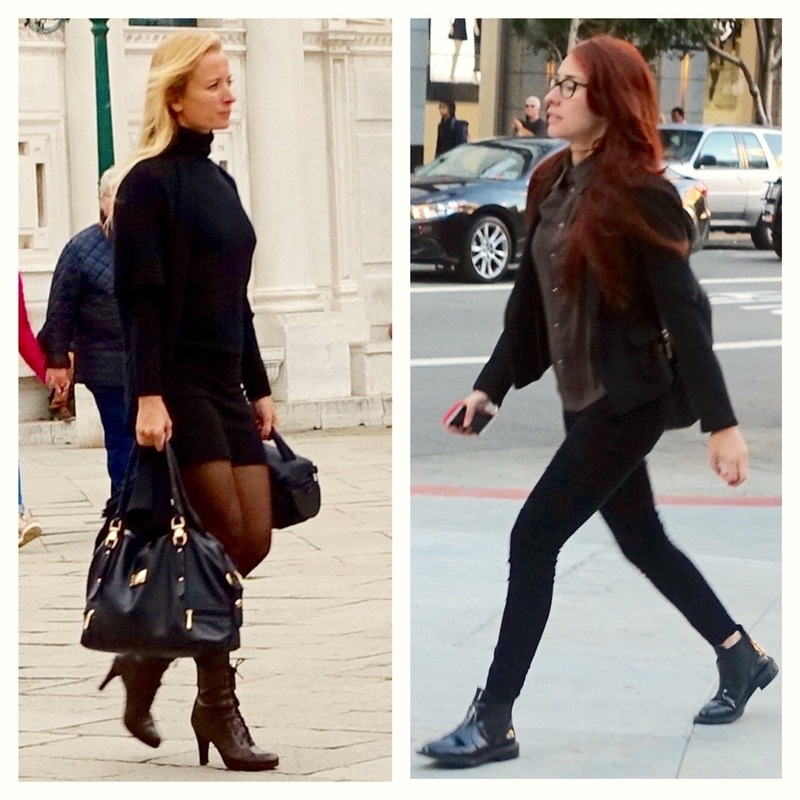 The lovely lady below and to the left demonstrates this principle with a cold-weather turtleneck combined with a warm season’s mini-skirt. 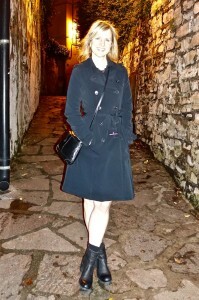 …as did Liliya in her all black #OOTD. My girlfriend Melissa wore all black to my afternoon civil marriage ceremony in Seattle and subsequent celebration with raw oysters, chocolate-covered strawberries and champagne. It was a treat to have such a stylish witness! Melissa’s dress and coat by Rebecca Taylor and Nando Muzi boots, all at least 7 years old, prove that smart purchases stand the test of time and save money in the end. 6) It is easy (and economical). If you’re anything like me, you have plenty of black clothing. If you think about it, black is the most popular color of clothing and shoes sold in shops and boutiques – skirts, non-denim pants, dresses, jackets/blazers, and coats! So for most of us, creating new all-black outfits simply entails shopping in your own closets. Do you think you might want to consider going all-black more often? Which is your favorite outfit?